Chalet Laetitia enjoys the best of both worlds; the peace and seclusion of being located in a quiet cul-de-sac yet close enough to enjoy the superb skiing and nightlife that Meribel has to offer. Should you not wish to avail yourself of our minibus service. The ski bus stops 300 metres (approx.) from the chalet. *For the convenience of all, a mini-bus service will operate between set times morning and late afternoon. You can truly get a taste for living the high life in this extremely attractive stone and timber chalet with spacious living quarters and stylish, contemporary furnishings. Built on one of Meribel’s beautiful hillsides, Chalet Laetitia boasts fabulous views over the valley. Laetitia’s own private hot tub offers the perfect place to enjoy your surroundings and surely there is no better way to ease those tired legs and relive the adventures of the day. Alternatively you can make use of the gym equipment if you want to stay in shape whilst away. Additional luxuries that really make this chalet special include a large cinema room, satellite TV, DVD player, sauna, heated boot room and large fireplace. 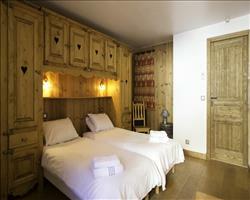 All rooms are en suite, many with Jacuzzi baths and terraces for that little extra luxury. This beautiful chalet perfectly combines the indulgence of contemporary chic with the character of alpine charm. 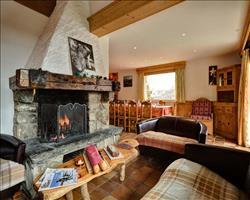 Early booking is recommended for a chalet of this calibre. Please Note: 2019/20 season Chalet Laetitia will be a 5 grade property and no longer include the Signature Service. 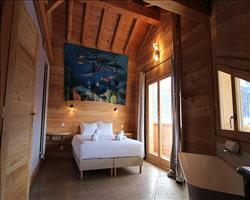 We update Chalet Laetitia's details often, but facilities do change. e.g. some extras listed by the supplier as "free" or included might only be for the first time you use them, or for one time per party, then charged for further use. If any specific feature is essential to your holiday, make sure you ask us to confirm the details of it before you book your holiday. This all inclusive holiday to Chalet Laetitia in Meribel & Mottaret, France departs Saturday 11th April 2020, for a 7 night stay on a "catered chalet" board basis. A local tourist tax (Taxe de Sejour or Kurtaxe) is levied by many councils in European ski resorts. It varies by standard and type of accommodation and is age dependent, so not everyone is charged. It's not included in the basic price of your holiday and is usually paid locally. For reference, the average charged in winter 15/16 was between 50p and £2 per person, per night. Meribel & Mottaret lift pass price last reported as €212 (adult 6 day). 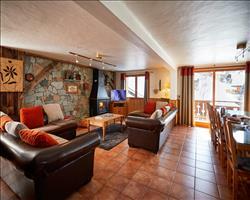 Ask for a quote when booking Chalet Laetitia. 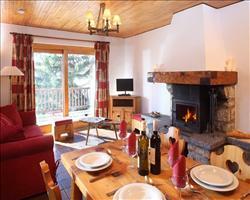 "Our best ever chalet holiday - Amazing." Imo and Becca were exceptional Chalet hosts. The catering was delicious and varied, always delivered with a smile. The girls were delightful and so organised. We felt really spoilt by them, nothing was too much trouble yet they created a really relaxed atmosphere. We enjoyed the extras....Hot tub, sauna and cinema room. All in all a fantastic holiday. We wouldn't hesitate to return to, or to recommend a chalet that Imo and Becca were hosting! "Sno wonder this is so popular - book early"
This is what baby chalets dream of becoming when they grow into swanlike adult chalets - space, seclusion, views, luxury and comfort - as well as good access to the piste and après ski. Not only does it have fitness, spa and entertainment facilities, as well as en-suite bedrooms throughout; but it is big and spacious, and has some of the best views overlooking the village from this beautiful cul-de-sac. Take the bus (stopping 300m away) to the lift area or the town centre; and for the real adventurers, off-piste skiing is possible to within less than 100ft of your doorstep.